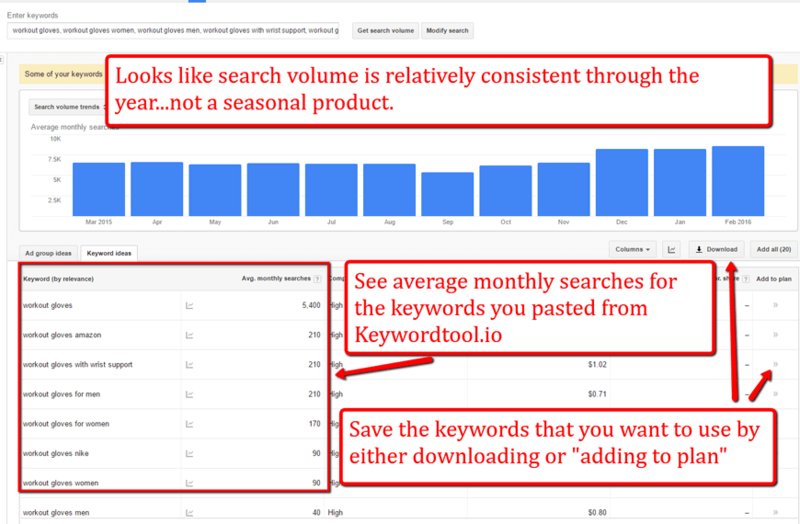 When launching a business on Amazon, keyword research is an obligatory step. Seeking the important keywords for your future product will help you to understand your niche better and get potential revenue by adding more valuable keywords into the queries. Probably, you’ve already seen all that mega-long over-optimized titles and you may wbe interested if such things really work by making a potential customer paying attention to these items. Of course, people are not too fascinated by such lo-o-ong sentences, but Amazon search algorithm values them greatly. I’ll tell you about effective tools of keyword research in this article. So, it will surely help you to generate more revenue and get more sales! This online marketplace is one of the biggest search engines in the eCommerce world. 1/3 of all world’s searches. Millions of products can be found here (they say that the number is around 500 millions). Amazon customers are very focused on the purchases, they type the product’s name they want, and choose the one they like the most quickly and efficiently. After we know that Amazon shoppers want to buy something so strongly, it’s important for your product to be shown at the top of the search list while they look for some phrase or word. There is a list of factors which help your product be ranked higher by Amazon. They are: your rating and the number of positive reviews, the sales volume, the conversion rate and the number of visitors who looked through your product’s page, and also the relevancy of your item to a search query. It may seem difficult at the start, but it all affects your sales and revenue, and it’s in your interests to make the things go correctly. The good news is that there are some true based on the quantity ways to learn how much words you should include into the listing to make your relevancy the best and getting more sales. I’ll tell you about TWO finest tools for finding the best keywords! It is a completely free feature that shows an estimated search volume of a specific phrase or word, and helps you to look for some other phrases related to yours. 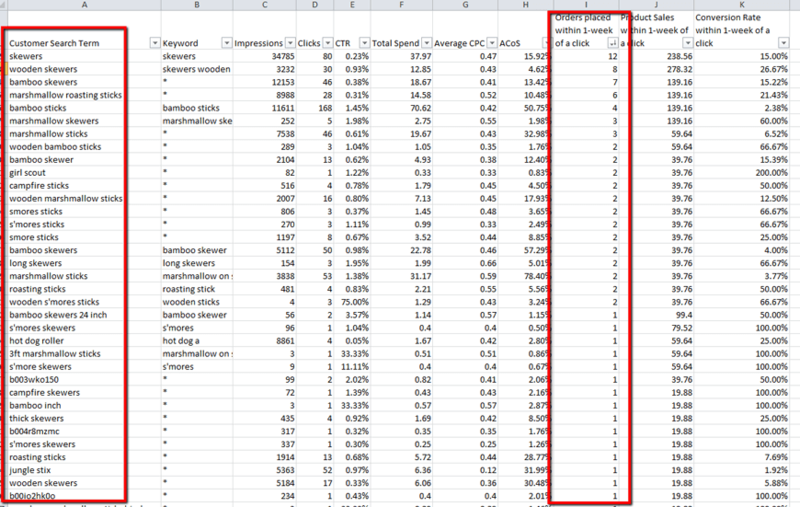 Google has already collected a plenty of data, and their Keyword planner gives you a free access to it. It tells you how many searches a particular phrase receives. The data can be also segmented by geography that can help you in case you sell products on different marketplaces. 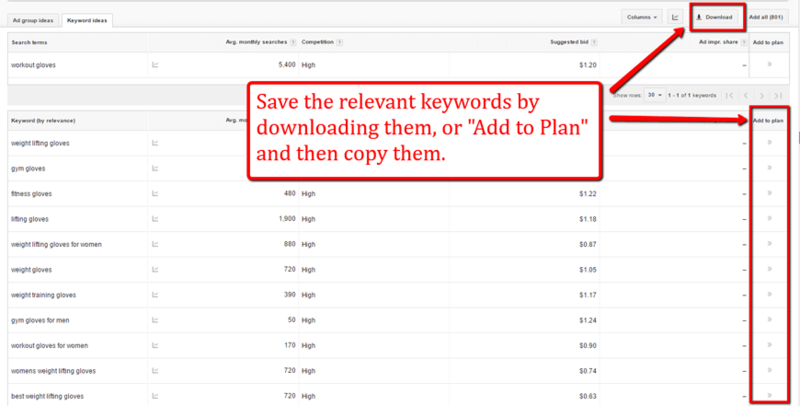 Note, that Google has some restrictions on using the keyword planner. 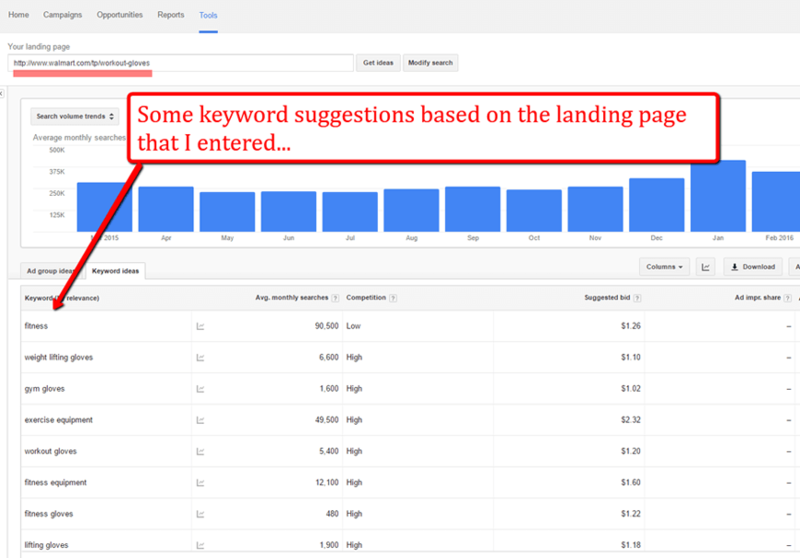 You need to have an AdWords account to get the full functionality of the tool. Before you have it, you may get limited results. Creating an AdWords acc is completely free. You don’t need to create any ads there or deposit money. Just register for free there and see the Keyword planer. It’s situated under the tab called ‘Tools’. 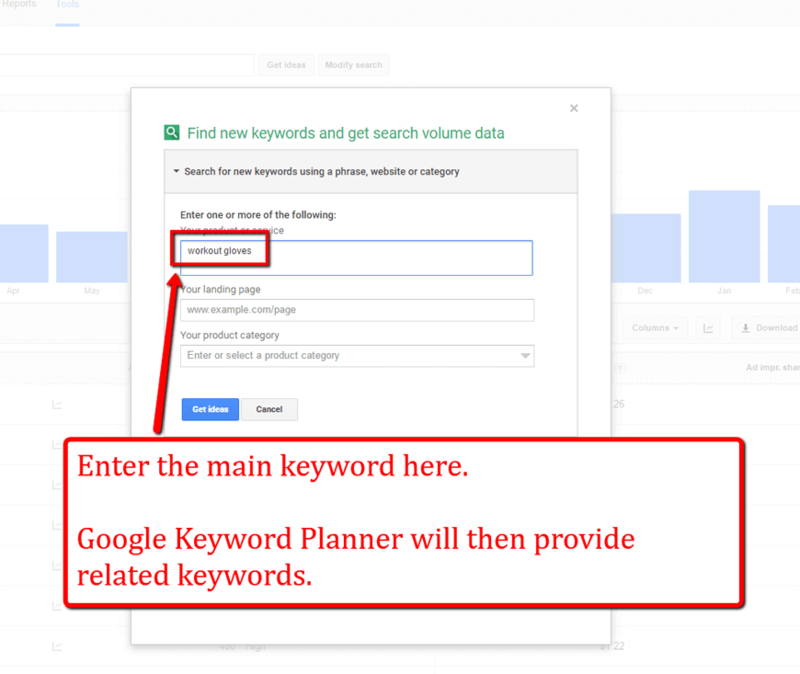 There are some useful methods how to get relevant words from Google keyword planner (GKP). Keywords sorted by relevance. It’s a list of words and phrases that are the most relevant to one that you’ve entered. Average searches per month. Maybe the volume will slightly differ from the one you see on Amazon, but it will be the same relative. So, this tool will help you to give priority to certain words and it will surely help you to attract traffic on the Amazon marketplace. Suggested bid & Competition. These columns are aimed for creating AdWords campaigns, and won’t be able to help you in optimizing Amazon listing directly. Nevertheless, if you grow your business large enough and create a website for your business, they will help greatly in promoting it in the web. 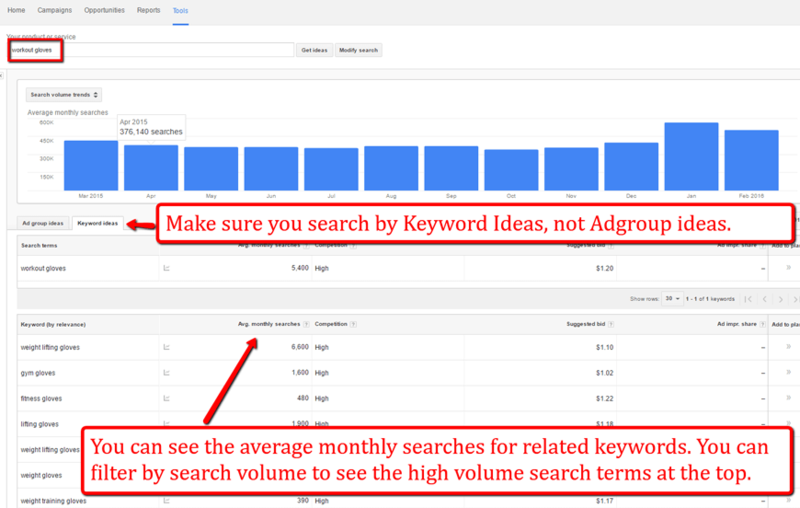 Do that if you need to know what keywords does your competitor use. Don’t you know what words and phrases can be relevant? Start your research with referencing a site of your competitor. Think of some similar competitor’s product and let Google to do the magic. For example, let’s continue with ‘gloves’ we’ve already talked about. I google for ‘workout gloves’ and get organic results. We see a Walmart’s page at the top. I enter their URL into the keyword planner. It can be done under the box called ‘Your landing page’. Before starting to save all relevant words and phrases from the GKP, rank them by the search volume. The saved list of the best keywords and phrases will be useful for your further work as it is based on the priority of the volume, monetary value, etc. 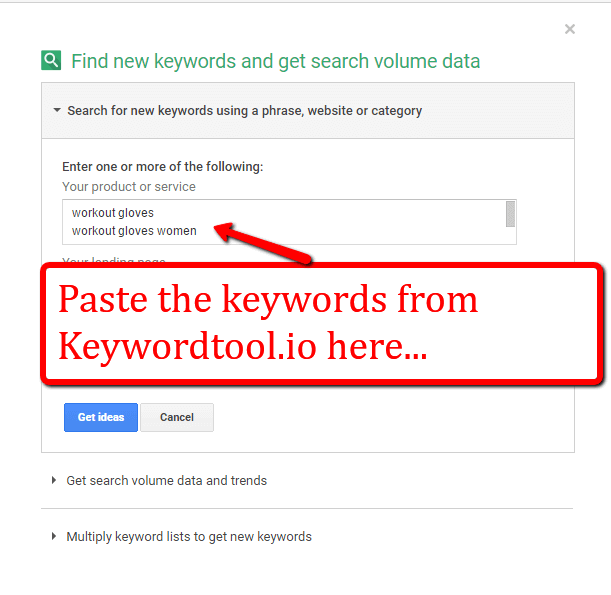 It’s another handy and efficient feature for searching keywords and phrases. It works similar to GKP. Enter a word, get a list of related keywords, and phrases that your target audience usually searching for. The nice news is that you can get a list of keywords especially for Amazon (as well as YouTube, Bing, and some other resources). You can research long tail words with this effective tool, as it uses Amazon’s ‘Auto complete’ feature to look for any relevant word that would be mentioned in your listing. 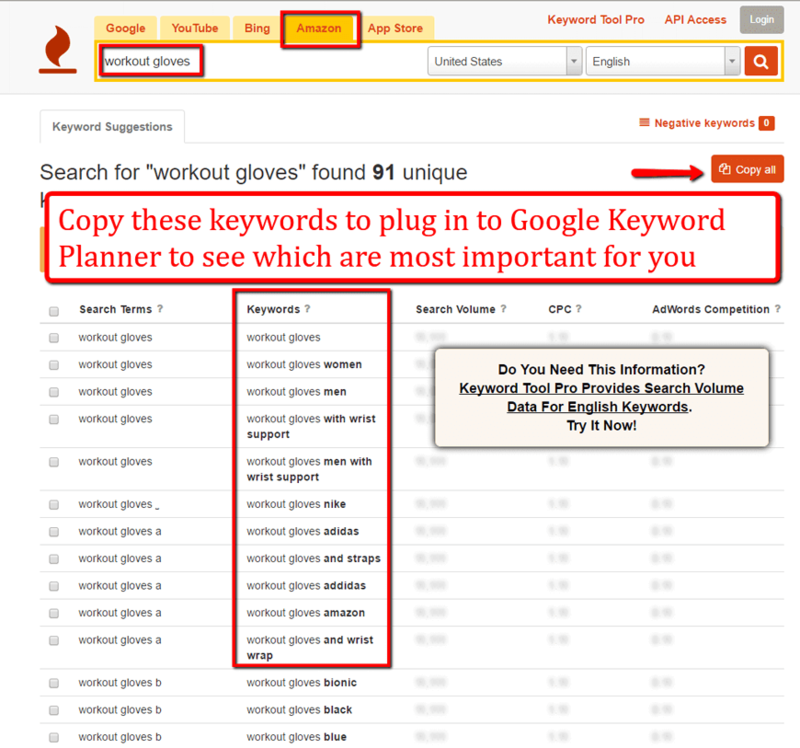 Here is an example of long tail keywords for ‘workout gloves’. Copy them and paste into GKP to get the search volume. Of course, they may base on the traffic from Google, but don’t hesitate to use them on Amazon, as these things are relatively similar. It will help you to generate traffic for sure. Use this opportunity. 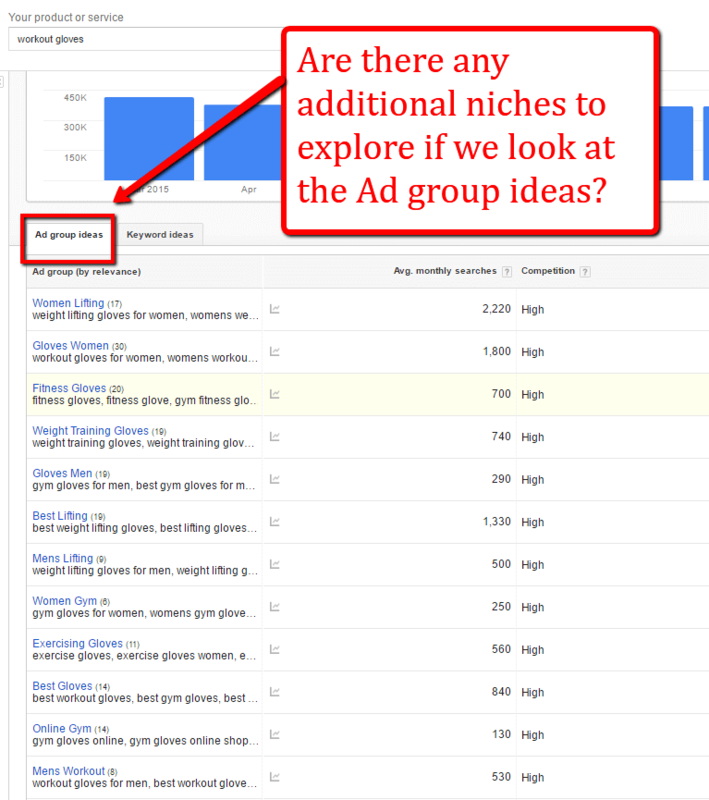 If you have a listing on Amazon and run a PPC campaign for it, see the queries which trigger your advertising. Automatic targeting has it’s benefits. Amazon shows the ad to every query it thinks it’s relevant. 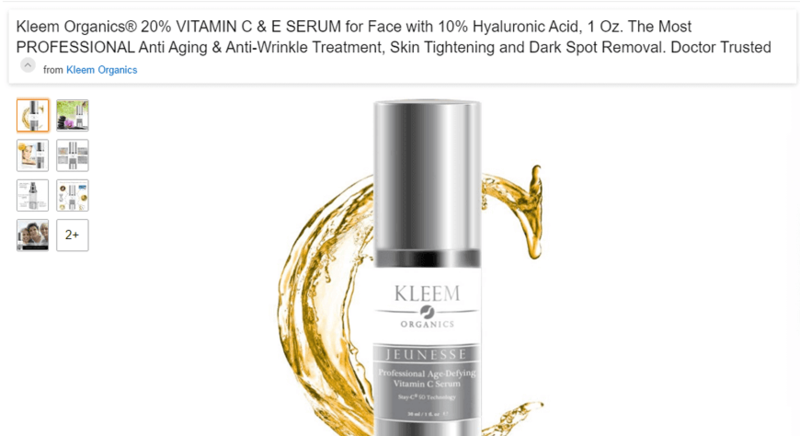 It takes the info from the description of your product. So, that king of targeting can be so broad, that you may pay for unnecessary clicks and get the traffic you don’t need. Anyway, the benefit is in the fact that you find some nice keywords that you haven’t noticed earlier. It’s the whole data from campaigns. As you see, there are some shoppers’ searches we didn’t know about that have generated some sales! So, adding them to the listing makes sense. Soovle is one more helpful resource for working with keywords. 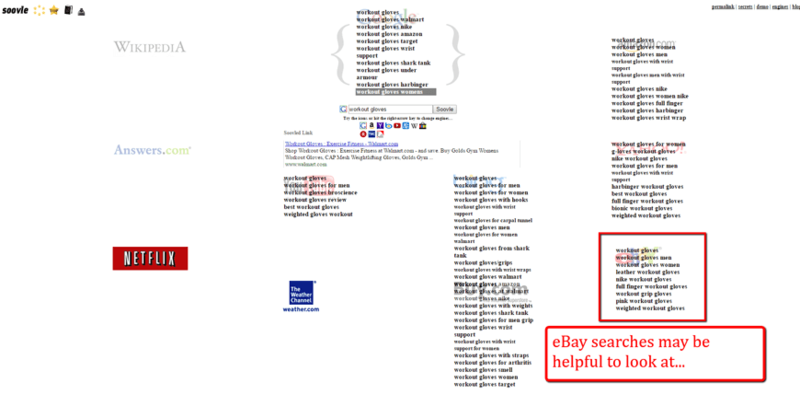 It offers queries from eBay, but it’s also queries from people who are purchase oriented. With optimizing your listing with the related and relevant keywords that are really used by shoppers, you may the way to success easier and shorter. There are a lot of free tools and features that provide you with the freshest and the most helpful data for creating your own well-optimized listing. I have already experienced the power of optimized keywords and wish you success as well!